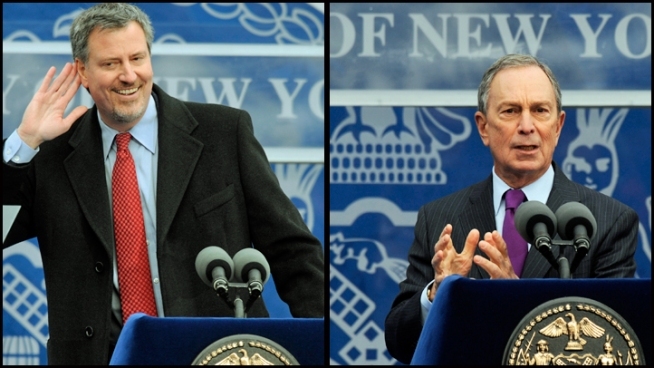 5 Things Mayor de Blasio Should Put In Storage. Our newly-elected mayor has been at the helm for three months now. To take his new job, he had to do what a lot of us inevitably wind up doing – pack and move. Though he still shoveled in Park Slope (fingers crossed that that weather’s behind us), Mayor D and the first family sleep it off in the posh Upper East Side these days. What could the Mayor have left in storage? Flatware. Brooklyn residents don’t eat Pizza with a knife and fork. The “that’s how they do it in Italy” excuse just doesn’t cut it. The pat down. We don’t stop and frisk anymore. We’re cool if this winds up as an abandoned bin too. Baby Einstein DVD’s. We don’t need em’ if we have universal Pre-K.
Bloomberg terminals. Have you seen how much desk space these things take up? Podium Risers. At 6’5″ and a full nine inches taller than our former mayor, Mr. de Blasio doesn’t need any help stepping up to the mic. Too bad he stinks at basketball.